of situations as they were unable to maintain enough power to keep up with the intimidating Yankees lineup yesterday. After MLB gave the Yanks an option of either Wednesday or Thursday to play Game 1 of the divisional series, New York couldn't help but take advantage of a burned out team who was clearly still in celebration mode. After arriving in NY at 3:30 a.m. and getting as much sleep as the could once the adrenaline wore off, the Twins were the first to answer with 2 runs early. The inevitable instantly answered in the form of 2 runs by the Bronx bombers. 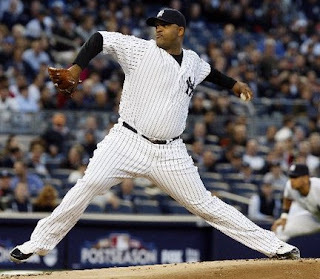 As the game went on , CC Sabathia showed spectators why he has a record contract to his name, fanning 8 Twins in 6 2/3 innings. The Twinkies were then unable to answer manufactured runs from arguably the deepest lineup in baseball. As MN fans know, however, this was not a true representation of the team they have seen play over the last month. Like Joe Mauer made clear after the game, they were a tired team, and showed it in the later innings. Friday's game should prove to show more of what the Twins are capable of; efficient base-running, timely hitting, and an attitude that screams "it's not over till we say it's over". Look for veterans Carl Pavano and Scott Baker to then lead the young team back into the series once they return to the dome for games 3 and 4. Until you witness an obese female bellowing the tune "New York, New York" count the Twins to be in this series.